We know that Jessica Minh Anh is a sensation in the world of fashion. The lovely model marked her 7th history making catwalk in New York. 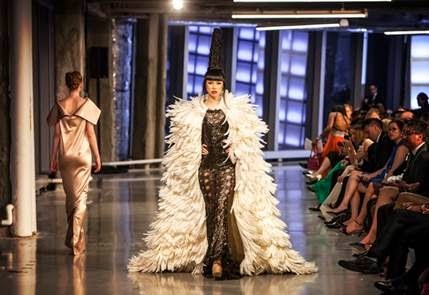 On the 63rd floor of One World Trade Center last Wednesday night, she walked in the runway with aplomb. Inspired by Jessica Minh Anh’s vision, eight designers from four continents gathered to celebrate cultural integration and premier their latest fashion creations. Filipino talent Puey Quinones opened the phenomenal catwalk with an impressive Haute Couture collection which combined pale pink undertones and strong earthy palates. Russian sensation Alina German followed with 15 unique designs that showed transparency and purity of colours and textures. Bringing sparkles all the way from South America, Peruvian artist Norka Peralta showcased crystal embroidered and laced dresses. In the accessory sector, America’s very own footwear brand CAT delivered timeless classics with a contemporary twist through rich leathered designs for men and easy – to - wear heels for women. Indonesia’s representative HAY UNITED spiced up the catwalk with bold colours, preppy looks, and pop art prints for active wear. The event was ended perfectly as Jessica showed off Ziad Nakad’s signature red dress and Brazilian designer Cristina Sabatini’s maroon and golden ring leading the models into the sunset.